Best Medical Canada is now distributing the highest quality medical thermoplastics and positioning devices to serve the needs of radiation therapists, occupational therapists, hand therapists, and other medical specialists. All items are produced with strict ISO 13485 certification and in compliance with all FDA, CE and other international regulations. 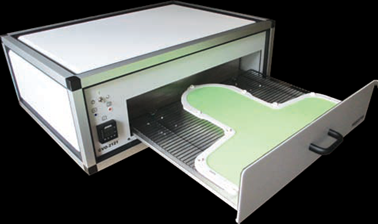 Our new Warming Oven softens thermoplastic material for radiation therapy to its optimum elasticity with safe, dry heat. Dry air convection heating speeds up workflow, reduces the risk of cross-contamination and eliminates other problems associated with water baths. Superflab bolus material is offered in thicknesses which provide maximum dose build-up for relevant photon energies. Since the material does not suffer inelastic strain from normal stresses, it does not have to be bagged or wrapped in plastic film to maintain its shape. 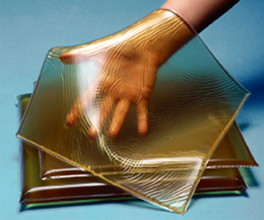 At the option of the user, however, Superflab may be wrapped in disposable plastic film for cleanliness and use, or it may be washed with soap and water as needed, followed by an application of talcum powder or corn starch. Superflab slabs are elastic and quite "flabby". The material conforms nicely to the patient’s contour while still maintaining good uniformity of thickness. The dosimetric properties of Superflab were determined by comparison with polystyrene of various thicknesses, using both photon and electron beams of various energies. Subsequently, it was compared with water and was found to be closer to simulation of water than polystyrene. Since this vinyl gel has both an electron build-up characteristic and a density closer to that of water than polystyrene (long accepted as a standard), it is anticipated this flexible tissue substitute will find wide acceptance in radiotherapy departments. Although Superflab exhibits very little cold flow, it is best stored flat, not folded. Because Superflab is an oil gel, care must be taken because the synthetic oils can damage plastic surfaces, particularly vinyl-covered furniture. Model 260-000 Bite Block System is a stand-alone patient head immobilizer system that needs no fixing to a treatment table and can be moved from room to room. The aluminum base plate has protruding pins which fit into the holes in the bottom of six different sized head-neck supports, thus locating it to a fixed position every time it is being used. 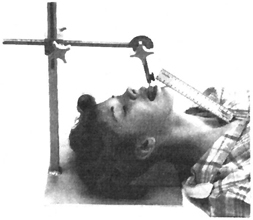 In some treatment set-ups it may be necessary to angle the head to the right or left. For these treatments, place the horizontal adjustable base on the base plate and lock in the position with two thumb screws. The head-neck supports also fit onto protruding pins located on the horizontal adjustable base plate or the pediatric adjustable base plate. A three lock system allows for easy adjustment and reproducibility. 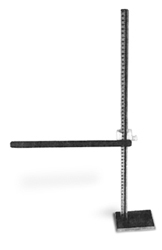 Vertical and horizontal adjustment is accomplished using 15cm scales and two locking knobs. The bite block tray angle is adjustable using a 180° scale and is locked with a knob. An easy-to-remove individualized bite tray uses dental impression material. The impression procedure takes ten minutes using dental impression material (Model 266-100), available as an optional item. One pack will do 15 to 25 patients. A fast setup can be accomplished by using the Nasal or Bridge trays. Rest the patient’s head in the correct head-neck support, adjust the head for the desired chin-to-sternal stretch distance, lower the nasal or bridge tray and lock. Six different heights and contours provide the versatility needed to attain the desired head angulation. Designed to fit the average adult head, these supports are soft enough to be comfortable for the patient, but firm enough to prevent "sinking" after the head is set. Use of the Head-Neck Support improves treatment accuracy by helping to ensure the same head position from day-to-day while the cradle helps prevent inadvertent rotation. Lateral and anterior fields of the head and neck regions; improving head extension with treating mantle fields; as a general use pillow; adaptable as a forehead and anterior neck support when treating posterior spine and brain fields. Model 248-000 Head-Neck Supports are made of molded polyurethane foam with a smooth durable surface. They are easily cleaned with water or alcohol and each support is lettered for easy identification. This product is not intended to provide complete immobilization or to be totally radiolucent, although the attenuation is minimal. Furthermore, because of a possible skin reaction, it is recommended that radiation treatments not be given in such a manner that the beam passes through the support before reaching the skin. It is supplied in a set of six of assorted sizes, "A" through "F". Model 249-000 Head-Neck Supports are made of thin, clear plastic material. The plastic thickness ranges between 0.75mm and 1.5mm. They are the same size and shape as the foam-rubber head-neck supports and carry the same letter sequence for identification. There is minimal or no skin reaction observed when treatments have been given directly through these supports. Normally no transmission correction needs to be applied for most high-energy beams. The product, however, is not intended to provide complete immobilization. Supplied in a set of six of assorted sizes, "A" through "F". The body calipers are designed with a unique measurement safety feature. The measurement safety is accomplished with one scale and a non-removable slide that prevents errors caused by reading the wrong scale on a dual scale of combination calipers. The slider can be locked at any patient thickness. The head-neck caliper is useful in measurements of either patient diameters or surface-to-tumor depths. The depth of a tumor or intraoral structure relative to either the lateral or anterior/ posterior surfaces can be easily determined. Vertical adjustment is 23cm, horizontal adjustment is 26cm. The table top caliper with a 55cm scale can only be used to measure from the table top to the top surface of the patient. The under/over table body caliper with a 55cm scale measures 6.5" from the base plate to the curve blade. The blade is 15.5" long. The lightweight body caliper with a flat blade is used for measuring body parts. The rigid leg that slips under the patient is 1/8" thick and 11" long. The scale is available in 45cm and 55cm lengths. This lightweight precision body caliper is used for measuring body parts. The rigid leg that slips under the patient is 1.8" thick and 11" long. The scale is available in 45cm and 55cm lengths. The breast bridge aids in setting up portals for tangential breast treatment. After the area to be treated has been marked, the breast bridge is placed on the patient’s chest and adjusted to the skin markings, thus determining the separation of the fields. The angulation of the portals is determined from the ball protractor as on Model 270-000. If the radiation unit cannot be rotated, the patient may be propped by tilt board or a spine wedge until the spirit level on the bridge shows that the plastic plates are vertical. Once the portals are set, the breast bridge may be removed. These plates measure approximately 15cm x 20cm and have inscribed center lines. They can be set for separations from 15cm to 35cm. 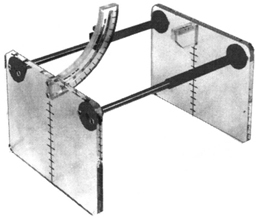 The ball protractor provides angulation readings from 15° to 80°. The Breast Bridge Compressor is used to compress the breast, particularly when it is desired to increase the dose to the residual mass at the end of a course of treatment. The aluminum mesh and frame are coated with a vinyl plastic for minimum skin dose. The blue vinyl plastic is smooth and warm to the touch. 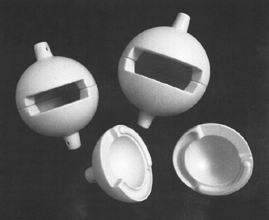 These lead shields, available in three sizes, are designed to eliminate and reduce scatter radiation to the testicles. Each unit is cast to provide a wall thickness of 1/2" and features an open sector to allow comfortable attachment to the patient. All surfaces are coated with a beige polyurethane paint to reduce lead exposure. The shields’ top and bottom sections are secured with two rubber straps (supplied with each unit) or may be secured with nylon tape. When using the stand, no straps are needed. A special dome and groove design between the two halves stops radiation leakage and prevents the halves from sliding apart. Rotating the entrance of the shield toward the ceiling will also reduce scatter radiation from entering the shield. A soft cotton sock can be used to cover the testicles when placing them inside a cold shield. Designed to move all or part of the testicle and scrotum out of the direct beam while irradiating a portion of the scrotum. Constructed of sturdy, clear acrylic, this T-shaped device features a grooved adjustment blade that easily adjusts to any vertical or angled position, then locks into place with a turn of a knob. This easily adjustable shield stand will cradle testicle shields, offering increased patient comfort while raising and lowering the testicle shield. A hand knob allows for easy vertical adjustment from 1" to 10" at five turns per inch. 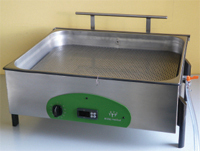 A plastic plate secured to a cast iron counter-weighted base provides easy positioning. It can be used for anterior and posterior treatments. Testicle shields that incorporate the dome and groove interlocks do not require rubber straps to hold the shield halves together when used with this stand. Cooling cover with three handles. Digital display of temperature (°C).